Show you LARP sword or dagger a little love. Buy it a beautifully designed leather hanger to sleep in. 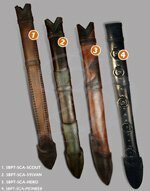 These holders are specifically designed to hold LARP swords or daggers (and they do a brilliant job at it). It's really not that complicated. These frogs are built with a perfect angle to them so the sword hangs naturally and is eminently easy to draw. The belt loops at the top of the hangers fit most belts. These hangers are available in black brown or black green or black and left or right draw. I just want to say that I have rarely, if ever received such fantastic service without so much as a question or hindrance of any kind. Thank you very much for your quick response and delivery as it really made the difference when it mattered the most.